Smith hasn’t played since December 8. Prior to that, he was trying to play through the injury. 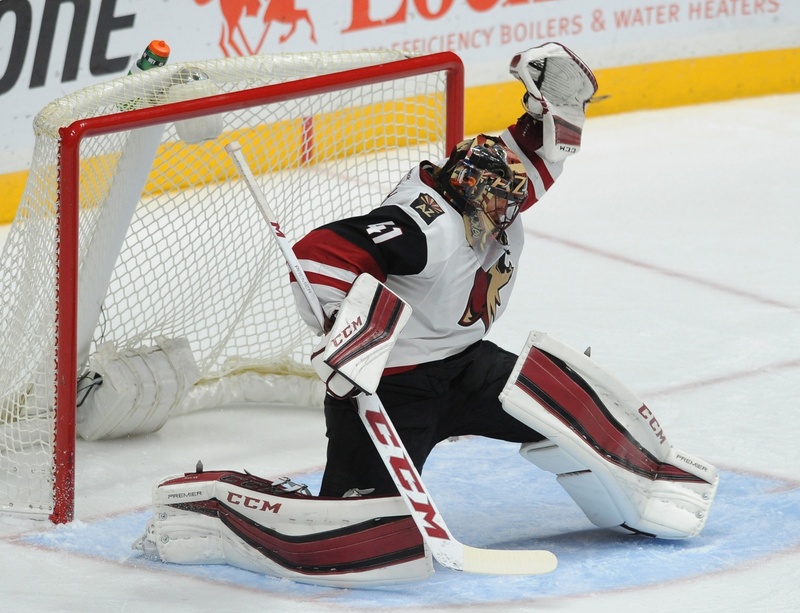 Smith is 10-9-1 with Arizona so far this year, with a 3.06 goals against average and a .901 save percentage. Those aren’t good numbers, but the Coyotes have been able to put together a surprising season all the same. Whether a matter of lowered expectations or a matter of desert grip, Arizona sits 14-14-2 and second in the Pacific Division. Smith, for all intents and purposes, has not played well for a while and one has to think the Coyotes are stuck with him and his big contract for the foreseeable future. That could mean that Maloney will look to made a deal. Anders Lindback is the backup netminder in Arizona, but he hasn’t played much better than Smith. He has a 4-5-1 record with a .900 save percentage and a 2.92 goals against average. The third-stringer is Mont St-Hilaire’s Louis Domingue, who’s 6-6-1 with the Springfield Falcons this season. The 23-year-old has a .919 save percentage and a 2.55 goals against average. So yes, the trade market seems like it could be a necessity if the Coyotes want to at least attempt a run for the post-season. They’ve allowed 95 goals so far, with only the Calgary Flames allowing more, and they’re going to have to come up with a way to tighten up if they expect long-term success. A team doesn’t win in the playoffs without solid goaltending. This presents some interesting possibilities. For one, Anton Khudobin was put on waivers by the Anaheim Ducks and could be worth a look. The 29-year-old from Kazakhstan has a 3-3-0 record this season with a .908 save percentage, but he could find his game with the Coyotes. Others have pointed to besieged Toronto netminder Jonathan Bernier as a possibility, especially after his AHL play seemed to rejuvenate him. He stopped 91 of 96 shots he faced on the conditioning loan to the Toronto Marlies and could be the goalie the Coyotes are looking for.